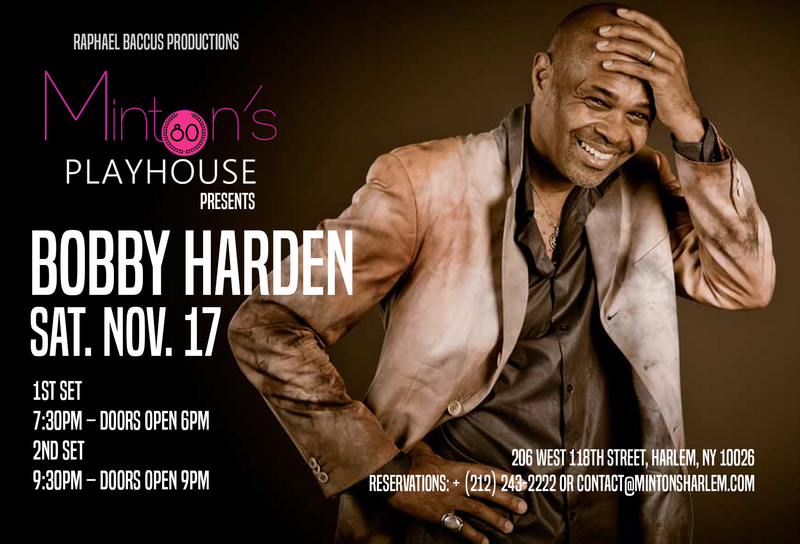 Bobby Harden – 17 Nov. Originally from Youngstown, Ohio, the fertile soil that also gave rise to legends such as: The O’Jays , Ohio Players, Bootsy Collins and Bobby Womack, Bobby started his own musical legacy while residing in Houston, TX. Today, the “Big Apple” is now proud to claim Bobby Harden as its own “Soul Man in Residence”. Simultaneously in the past Bobby has also shared the stage with soul legends Solomon Burke, Eddie Floyd, Ben E. King, Robert Cray, Delbert McClinton and Howard Tate.He was also a member of the famous NYC band [and legendary horn-section session men},The Uptown Horns. Bobby’s premier musical passion and talent though, lies within his own wonderful music…as shared with the world on his own record SOUL PURPOSE. An even more extraordinary musical plateau is about to be reached with the soon to be released RIVER OF SOUL album, with invaluable assistance by music guru & musical director of the SATURDAY NIGHT LIVE BAND, Leon Pendarvis.